Five performances from 14 to 18 August, of a Cirque du Soleil 75-minute special show, produced by 45 Degrees, based around the culture and history of the Principality. 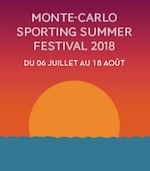 Check out maBoum's listing of all concerts and shows in the Summer Sporting Festival here: Monte Carlo Summer Sporting Festival 2018. For more information phone +377 98 06 41 59, email ticketoffice[at]sbm.mc and visit the event website at: Monte Carlo Live: Sporting Summer Festival programmation.